Sale of heat technology as well as steam sterilisation in the highly competitive US market is quite a demanding process. Together with different technical parameters (voltage, dimensional units, etc.) and certification standards (UL and CSA compared to CE), the clients require prefect and fast service, communication and prompt deliveries. The general technical level of devices is a little bit lower and so the price level is also lower, which is more demanding for our high-tech devices. We exported many pieces of thermal equipment from Brno to our branch office in the USA last year. Partially on stock, partially directly to the customers. The branch office reported sales reaching 80% of the whole last-year sale level in the course of the first two months of this year. At the present time, approximately 30 sub-distributors sell our thermal equipment in the USA and Canada.The branch office employees regularly participate in exhibitions in the field of laboratory equipment. Traditionally, annual PITTCON is one of them. It started in Chicago at the beginning of March this year – the conditions were really winter and the outdoor temperature dropped below zero. This year we have extended the booth to two modules, but anyway, these have also been full all the time. The new CLIMACELL EVO was in the centre of attention. Old and new partners from the whole USA arrived to see it. We obtained contacts to 25 new distributors in the USA and one from Canada, Ontario. The exhibited devices attracted attention of many end users, employees of laboratories and universities. This year´s really winter fair surprisingly attracted many employees from South America, mainly from Mexico this year. Traditionally, there also arrived our long-term distributors from the Far East - Singapore, Korea and other countries. 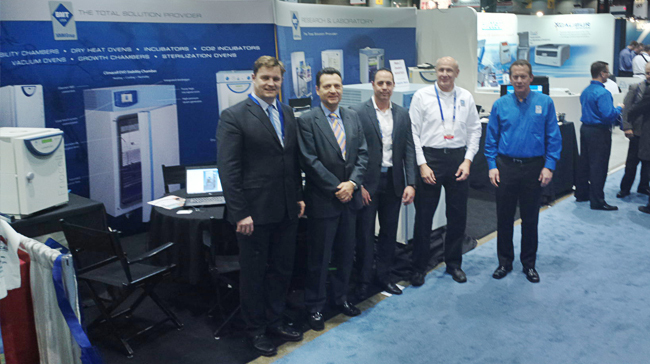 The main event in the field of steam sterilisation is the Interphex fair, held in New York in the second half of March. But we succeeded to obtain a few good contacts even in Chicago. Thanks to well coordinated and experienced team and favourable business atmosphere we expect very interesting sale volumes in steam sterilisation as well as in thermal engineering in the US market this year.